This quick review was provided by Ann, who is allergic to gluten and soy, and has a vegetarian diet. Before we we were diagnosed with being gluten and soy sensitive, we enjoyed many a meal at Les Chefs de France. 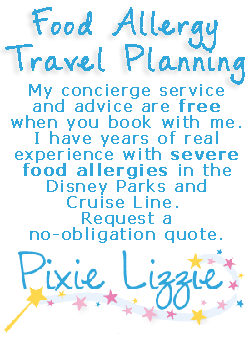 Unfortunately, this most recent experience in September 2011 was the worst allergy experience I have ever had on WDW Property. The chef was less-than-happy to come out to talk to us about our needs. He turned his nose up to our allergies and said “well, I’ll just make you a plate of sauteed vegetables”. Ok, that sounds great, we love vegetables!! The waitress brought out some Ener-G rolls, hot and wonderful, with real butter. They tied us over until we got our meal. 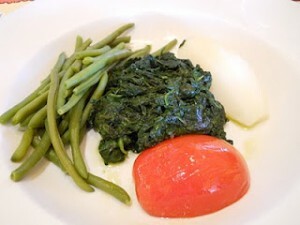 What we were served was a blob of spinach, half of a boiled peeled potato, half of a boiled tomato, and some green beans. No salt, no pepper, no oil, no nothing. And we were charged almost $20 per person for this. Unfortunately, we will not be going back, and I’m saddened to say that I have heard others with equally bad allergy experiences at this restaurant. I called Disney and complained about our experience, and the Cast Member I talked to couldn’t believe it, and apologized for our poor experience, but was grateful that I took the time to share my concerns. That is disappointing! My husband and I (GF) have reservations at Chefs de France around Christmas and, since I’ve never eaten there before, we’re hoping for a good experience after seeing how accomodating other restaurants in DW can be. If we don’t end up changing our reservation, hopefully they have used the time between your visit and ours to improve! You may want to contact Special Diets to contact Chefs de France in person. We’ve had / heard of mixed reviews about this restaurant, so you may have the same great experience we had. When are you going? We are also going to be there around Christmas and planning to eat there again. Additionally, we’re planning a special allergy free dessert party with a special view of IllumiNations. It would be great if you could join us. Use our contact form if you want. 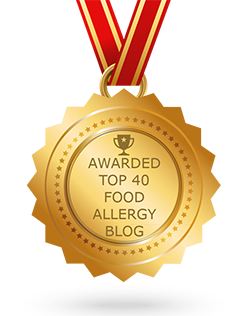 Please do not go here with food allergies! The chef made me feel like an inadequate human and my meal was terrible. I was sick immediately after. In the bathroom, there was a two year old who was having an allergic reaction. The child’s mother told me that the chef refused to speak with her prior to eating.There are so many accommodating restaurants in the parks.As for Epcot, I think I think I will stick with Coral Reef, Tokyo Dining or The Land from now on. Planning a safe, worry-free honeymoon for my dairy-allergic wife and I was intimidating...We were able to have a great honeymoon experience at Disney World.